On June 21-22, the ZenFi team took a short trip from their Manhattan offices downtown to Cipriani Wall Street to participate in Telecom Exchange NYC 2016. 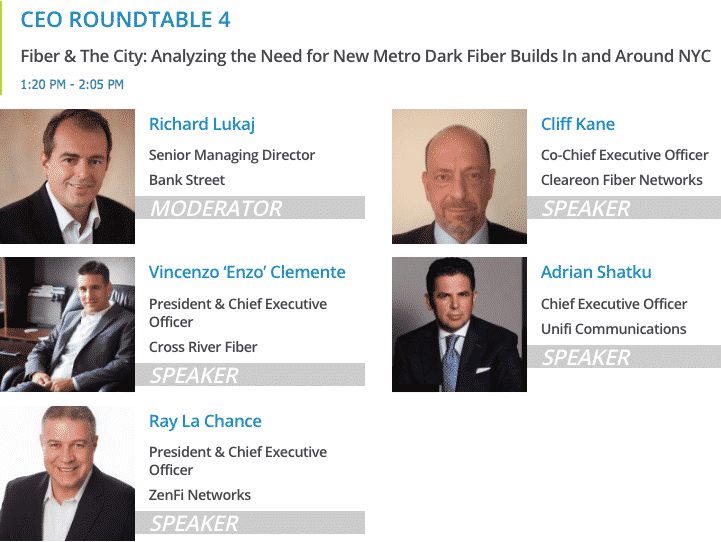 While attending the event, ZenFi President and CEO, Ray LaChance, participated on the CEO Roundtable, “Fiber & The City: Analyzing the Need for New Metro Dark Fiber Builds in and Around NYC.” Alongside industry colleagues from Cleareon Fiber Networks, Cross River Fiber and Unifi Communications, Mr. LaChance discussed the opportunities and challenges associated with the development of new fiber networks throughout New York and surrounding areas, including the ways in which these deployments support growing densification requirements for the enablement of the Internet of Things (IoT). When discussing the abundance of fiber throughout the New York metro area, Mr. LaChance was asked to comment on his perception of the current state of the market. If you missed out on Telecom Exchange, now is your chance to experience the CEO Roundtable from the front row, thanks to a video replay from JSA TV, a service of Jaymie Scotto & Associates, by clicking here. As capacity and accessibility continue to be the key drivers of new network deployment throughout New York City, LaChance and his colleagues made a compelling case for the need of enhanced bandwidth and increased investment in fiber. If you would like to learn more about ZenFi, please visit www.ZenFi.com or email info@ZenFi.com for more information.